I love the experiencing of arriving by plane in a foreign country—especially one I’ve never been to. I love the novelty, and, strange though it may sound, I love the feeling of vulnerability. Something as seemingly simple as navigating the airport men’s room is an uncertain and sometimes adventurous undertaking. And the birds! I love not knowing what to expect on stepping outside the terminal. Okay, probably Rock Pigeons. But after that? On a recent visit to South Africa, some of the species at the airport hotel included Speckled Mousebirds and Gray Go-away-birds, representing entire avian orders endemic to sub-Saharan Africa. Practically every bird I saw in South Africa was a life bird. (It “helped” that I was there in winter, meaning that boreal migrants like Northern Wheatears and Common Cuckoos were still up north on the breeding grounds.) All the plants were new to me. The odes and butterflies were new, too. The night sky was upside down. Afrikaans and Shangaan were strange and beautiful, and South African “English” tripped me up more than once. I’m riding shotgun (on the “wrong” side of the car, of course) with Christoff, whom I’d met, oh, 25 minutes ago. On the way out of the airport, I’d innocently muttered something about the legendary pelagic trips out of Cape Town, and, moments later, Christoff is on the phone, scheming in Afrikaans. “What was that about?” I’m thinking to myself. Next thing you know, Christoff informs me that we’ll spending the next day at sea. Can you believe it? The guy doesn’t know me from Adam, yet he’s just arranged to get me out on a boat for what just might be the most exhilarating seabirding experience on the planet—a South Africa pelagic. 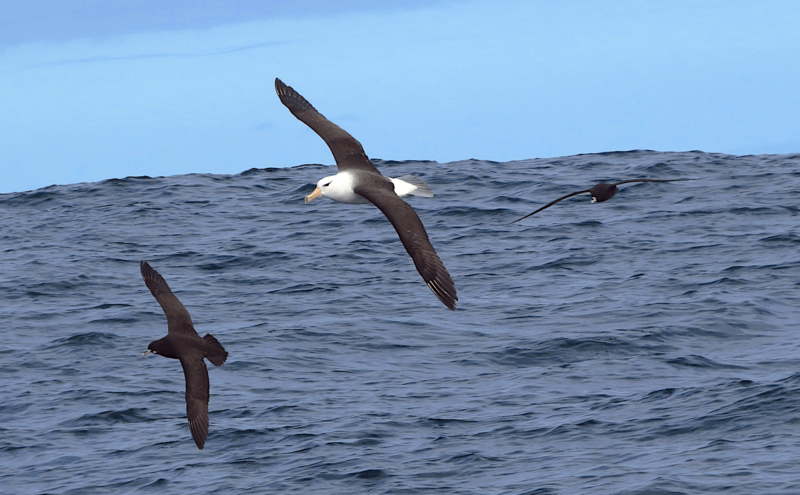 A Black-browed Albatross (center) accompanies two White-chinned Petrels on the ocean south of Gansbaii, Western Cape, South Africa. Photo by © Ted Floyd. The two of us, Christoff and I, are, in many ways, as different as can be, yet he knows, with complete confidence, that a landlubber from Colorado, way up in the frozen north, would, naturally, inevitably want to experience the albatrosses and Procellaria petrels of the Southern Ocean. Of course I would! My happiest moment on that boat the next day: when Christoff and the two other birders aboard were babbling excitedly and unintelligibly in Afrikaans about the mesmerizing spectacle of sea and sky filled with Antarctic Skuas and Pintado Petrels and Indian Yellow-nosed Albatrosses and Lord knows what else. I couldn’t understand a word they were saying, and yet I was in a condition of complete and perfect union with them. It’s late afternoon, and I’m birding in and around the harbor at Kleinbaii, a seaside hamlet down the road from Grootbos a little ways. So many of the birds are so very new to me: tchagras and fiscals, Karoo Prinias and Bar-throated Apalises, boubous and Bokmakieries and Brimstone Canaries. 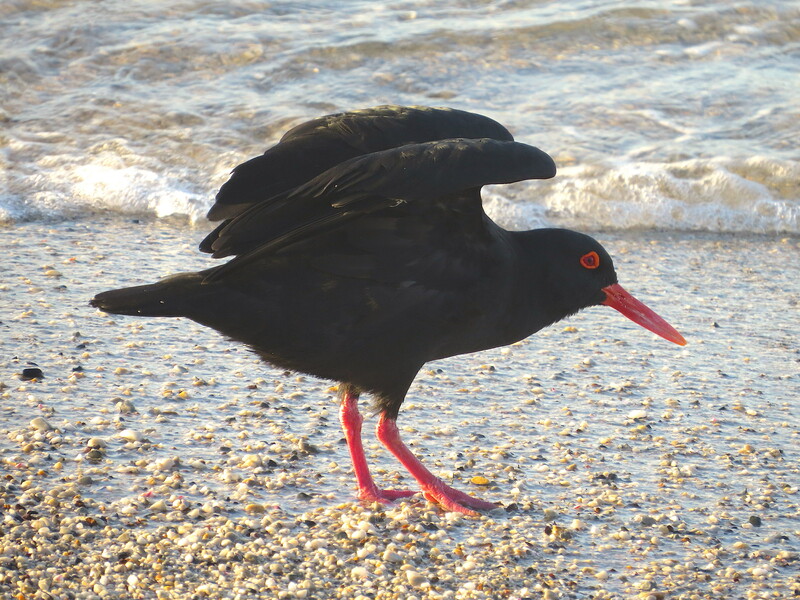 And one bird that, despite its ordinariness, particularly affects me: the African Black Oystercatcher. To be honest with you, they look awfully similar to the Black Oystercatchers and Blackish Oystercatchers back in my hemisphere. Yet they are bewitching. I can’t resist sneaking up on them, trying not to flush them, angling for the perfect view in the winter sunshine. A Black Oystercatcher, the BirdLife South Africa 2018 Bird of the Year, ambles in the surf at Kleinbaii, Western Cape, South Africa. Photo by © Ted Floyd. I don’t realize it at the time, but the African Black Oystercatcher is the BirdLife South Africa 2018 Bird of the Year. This is so perfect! One of the key ideas behind the growing Bird of the Year concept is that of celebration. Back home, in the ABA Area, we study and conserve and promote the bird of the year, but most of all, we celebrate. We unveil the identity of the bird of the year at the stroke of midnight on New Year’s Eve—glasses clinking, ball dropping, bird of the year proclaimed and celebrated! And so it is for me, literally on the other side of the Earth, yet in my element, delighting with South African birders everywhere in their yearlong celebration of the 2018 bird of the year. A Cape Robin-Chat gets in the last word at the Grootbos Foundation’s nature reserve near Gansbaii, Western Cape, South Africa. Recording by © Ted Floyd. Listen to the audio here: https://www.xeno-canto.org/429427. In conversation with a local birder, Peter, I would later learn that I’m scarcely alone in my fondness for C. caffra. In particular, Peter would bring to my attention the results of a recently conducted BirdLife South Africa poll of nearly 10,000 bird lovers. The question was simple: What’s your favorite bird? The answer, and the winner: the robin. But I don’t know any of that stuff as I’m standing in the gathering darkness in the great forest of Gansbaai. All I know is that I’m totally in love with this bird—easily learned and easily admired, showy and sassy, bigmouthed and brassy. What’s not to like? An encounter with a Cape Robin-Chat, whether it’s your first or five thousandth, stirs something in us. I’m of one mind, even though I don’t yet understand why, with South Africans everywhere. Remember Christoff, the guy who whisked me from the airport? He’s at it again. This time, we’re on the way back to the airport, a decent haul from Grootbos. But not before he shows me one last South African bird. He really wants to show me this bird. No, that’s not quite right. 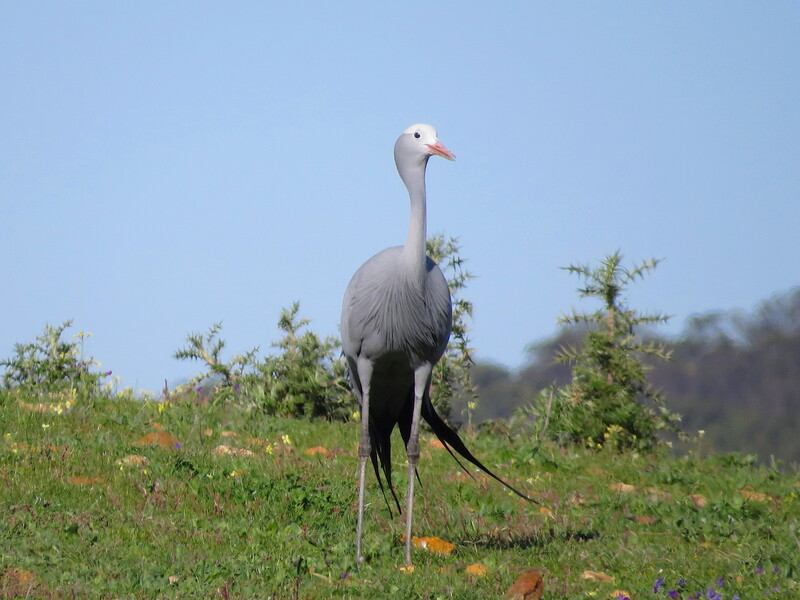 He needs to show me this bird, the Blue Crane, Anthropoides paradiseus, the national bird of South Africa. Christoff has a very real need to show me this bird. I get it. I’ve been there. I’m there all the time. Seeing a bird for yourself is one thing, but showing the bird to someone else—now that’s special. A Blue Crane, the national bird of South Africa, keeps sentry in the hill country beyond Karwyderskraal, Western Cape. Photo by © Ted Floyd. Christoff comes through: We’re rounding a bend on one of the innumerable unpaved back roads around Karwyderskraal, and there it is: an improbably, delectably, blatantly blue crane, just standing there at the crest of a short hill straight ahead. I’m pleased. Christoff is very pleased. I said it before, and I’ll say it again: I get it; I totally get the need, the very real need, to show birds to others, to share birds with others. The bird is a lifer for me, but this is Christoff’s bird, this is Christoff’s moment. Because at this instant in space and time, this is our bird, our shared experience. And that’s the point—the whole point, isn’t it?—of being a birder. My recent visit to South Africa coincided with the nationwide commemoration of Nelson Mandela’s 100th birthday, which was inspiring and, for an American like me, convicting. I saw evidence everywhere I went of the Mandela centenary: on billboards and storefronts, in airports and hotels, online and in print. And most of all, while birding. A final anecdote, then, if I may—not from the spooky fynbos forests around Cape Town, but, rather, from the iconic bushveld at the opposite end of the country, way up in the far northeast, at Sabi Sabi Private Game Reserve, near the Mozambican border. I’m birding with Jesse and Kumani, twenty-somethings, and, as you might surmise from their names, Jesse is white and Kumani is black. Like most black South Africans, Kumani is fluent in English. So is Jesse, of course, but here’s the kicker: With a little help from a friend, he’s learning Shangaan, the Bantu language his friend Kumani is most comfortable with. Most whites in South Africa never bother to learn the country’s indigenous languages. At one point, I ask Jesse why he’s gone to all the trouble. English is great for basic stuff, birds and meals and transports and such, Jesse explains to me, but Shangaan, idiomatic and densely figurative, is more efficient for important stuff: dangerous encounters with large game and poachers, delicate client relations, and strengthening a friendship. Birding brings us together—in time and space, on ships at sea and the sunbaked savanna and everywhere in between, but also in our hearts and minds. Christoff and Peter and Jesse and Kumani and I are, in terms of upbringing and ethnicity, so very different from one another. Yet we are conjoined, across great distances of language and geography, in the common cause of promoting the gospel of birding. We are of one mind, a collective, and the world is better for it.